Linda's Antique Reproductions are well marked as reproductions. Museum quality and reproduced authentically to the old masters work. Detail is paid to old factory techniques. 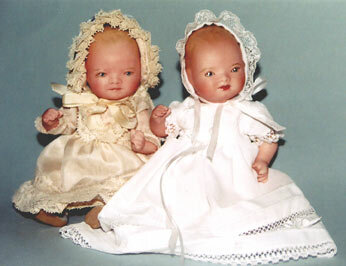 Fabrics and laces are antique if available or like the old fabrics and laces used at the time of the dolls creation. 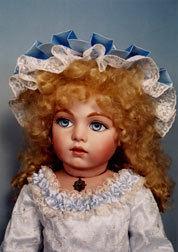 Pictures below are samples of some of Linda's Antique Reproductions. She has many reproduction molds. Contact her for your favorites. 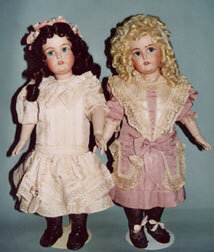 $1495.00 Bleuette on the left is ready for shipping. Doll in Cream $110.00 Daisy order your choice. 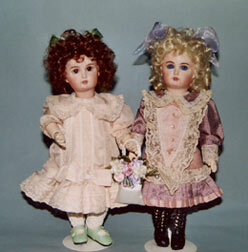 Linda Lee Sutton Original Porcelain Dolls. to Linda Lee Sutton All right reserved.